This page is dedicated to the personal pictorial memories of Ex PC. 840 'A'/161204 Len RICHES who served at Alpha Delta from June 1970 to July 1974. IF THE PICTURES ARE SLOW TO DOWNLOAD TRY HITTING 'REFRESH'. DOWNLOAD TIP FOR NEW VISITORS: BE PATIENT AND LET THE WHOLE PAGE DOWNLOAD COMPLETELY ON YOUR FIRST VISIT. THEY WILL THEN BE 'CACHED' ON YOUR PC. ON SUBSEQUENT VISITS THEY SHOULD DOWNLOAD MORE QUICKLY. IF YOU WOULD LIKE TO VIEW AN UP TO DATE PICTURE OF LEN AND SEE WHAT HE LOOKS LIKE TODAY CLICK ON 'SIGNPOST' IN INDEX ABOVE, THEN SELECT 'Alpha Delta Plus (3) then 'HOW WE LOOK TODAY (1)'. 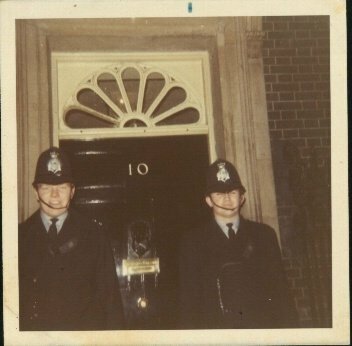 Budget Day 1973. London Evening News Front Page. Len's Brother In Law who worked in Hatton Garden and lived in Epping bought this copy of The London Evening News on his way home from work. He caught his train in the usual manner and fell asleep (also, probably in the usual manner?) without noting the fantastic picture of his Brother In Law on the front page. When he arrived home his Wife immediately noticed her Brother taking up large bits of the front page and immediately telephoned Len at home to inform him. 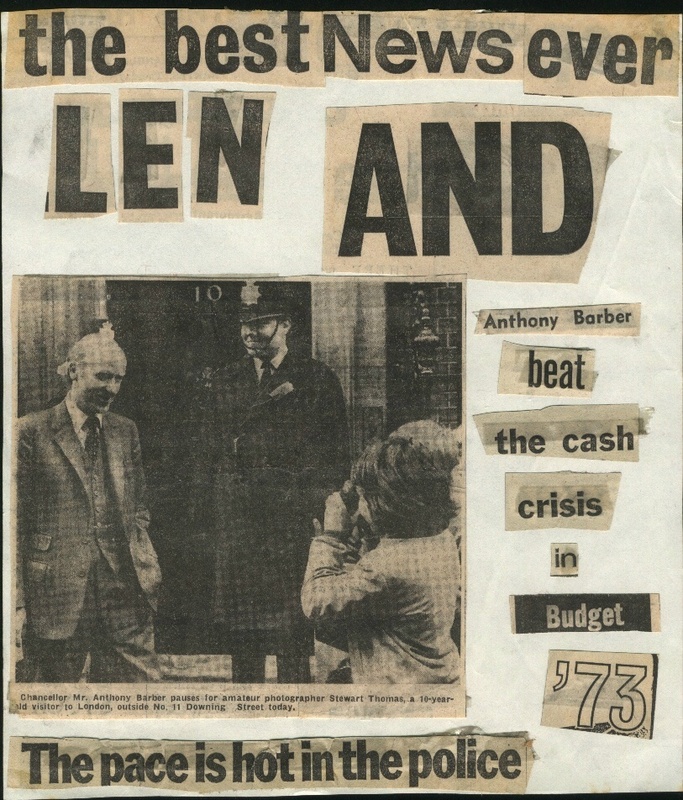 Len's Brother In Law then added the extra 'headlines' as shown today. Len and PC 495 'A' Ian JACKSON. 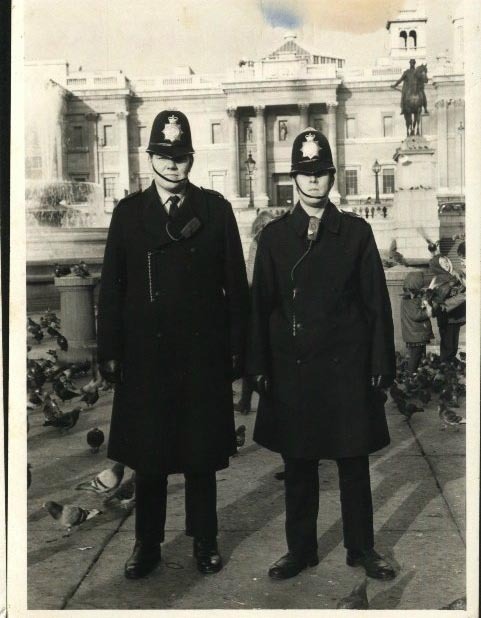 Trafalgar Square Thursday 16th December 1971. Late Turn. Len ably assisted by PC. 697 'A' Malcolm SHARPE. Trafalgar Square, Christmas Day 1970. 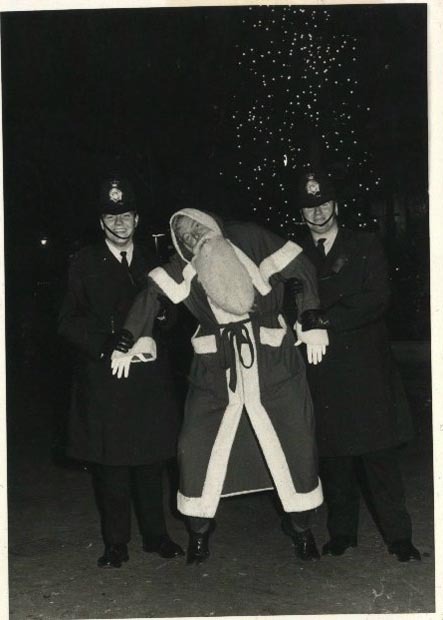 Len admits that this picture shows the happiness of being on duty on Christmas Day. He is pictured here with PC 731 'A' Colin KEIR. Colin transferred to Hampshire Constabulary and retired in 2001 after completing his 30 years. Click on helmet image to return to 'SIGNPOST' (Express Navigation) or BACK button for previous page/s.